Gooo @IsbUnited ..it's ur day today inshaAllah <3 All d best #Misbah and team (Y) #HBLPSL #KKvIU #PSLt20 #AbKhelKeDikha ! We will win InshaALLAH ???? ✌???????? Here we go again..!!! C'mon Islamabad..!!! 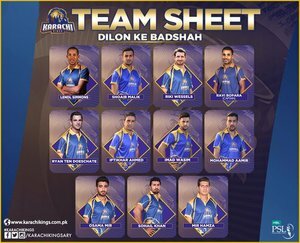 Riki Wessels and Lendl Simmons to open the innings for Karachi Kings. Here we go ... ???? And we are ready #PSLT20 #UnitedWeWin #Islamabad @IsbUnited ???????????????????????????????? That pic of sammy with tears is #PSLT20 described in one pic..! ???????? #PSLT20 #HBLPSLT20 #HBLPSL it time to replace #sarfarazahmed as a captian for #T20AsiaCup and #t20worldcup .